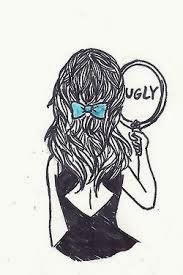 I stare at the mirror, such a weird feeling. It's as if I am denying what I am seeing. After loving what I saw for until now, just a few days ago I began to shun away from the mirror. All that I could see now was acne, few new ones still pink and hurtful and other painless ones who left their mark. Just few months ago I would not spend a second to think about which face wash to buy and now I spend hours wondering which one should I use. They seemed so tiny, as if I could ignore them but no matter how hard I tried I just could not. I started noticing others skin more keenly and i thought how lucky they were just because they didn't have few pink spots. I don't remember when was the last time I felt jealous but for the past few days I would get burnt seeing any girl with a clear skin. I felt as if I was being punished. This sudden hormone change which made my skin so acne prone, reminds me am not one among all. I wake up from these sad thoughts when I felt his lips kiss my neck, his arms wrapped around me and he says in his husky voice " I missed you so much my love ", it brought me back to my reality I turned away from my ugly reflection and looked into his eyes, it was then I realized, how pretty I was. A temporary condition blurred my vision from the beautiful life I had. I realized nothing around me had changed the love of my life is still crazy about me, my friends admire me and neighbors envy me. So I told my self few pink spots didn't actually change my life as I wrongly thought. I looked at the mirror and screamed at myself "STOP OVERREACTING".